Buffalo Grove police relayed a report from a resident that there was a coyote roaming around St. Mary’s Pkwy and Hiawatha on Tuesday morning. The resident wanted people be aware of this in case they have small animals (dogs/cats/etc.) outside. Sightings and inquiries about coyotes by our residents have increased over the past few years. If you see a coyote, do not run. Instead, make yourself look as big as possible by raising your hands over your head while yelling, and stomp your feet. 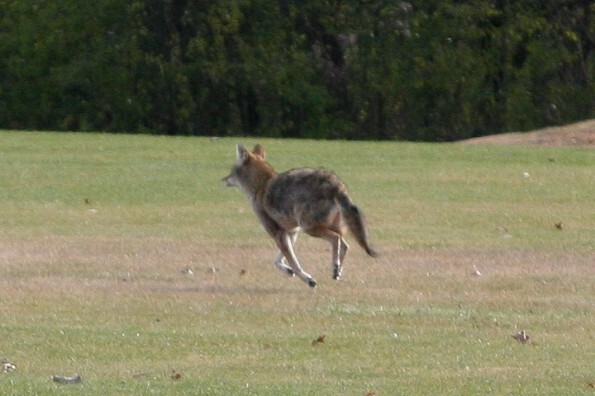 The coyote will typically jog or run away from you. If not, the coyote might have learned that the loud noises will not hurt them, and they will often just sit and watch you. If this is the case, simply back away and leave the area. If you are walking your dog during an encounter, keep the dog’s leash short and leave the area. However, it is possible that the coyote might follow you until you leave its territory. If your dog gets into a fight with a coyote, do not try to separate them with your hands, but use a stick or throw something. To find out more information on the coyotes in our area, visit coyotes. An informational flyer is also available at the Buffalo Grove Police Department. Coyote sighted on November 20, 2010 near Rand Road and Euclid Avenue.